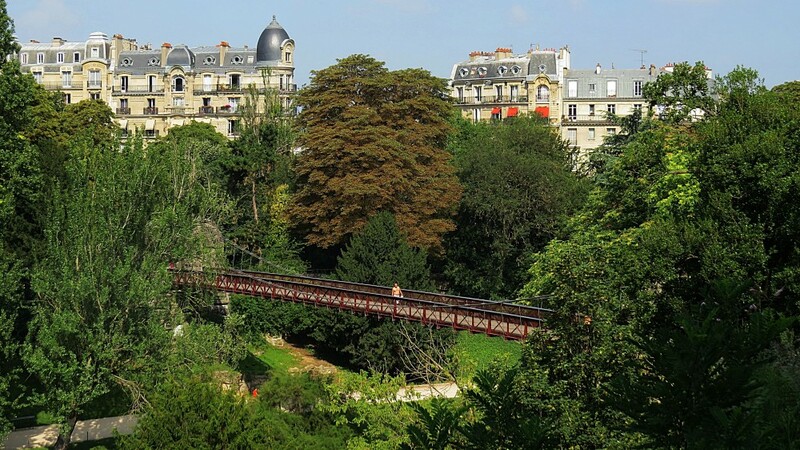 I doubt that the IXXth is a great arrondisement in which to live, but if I ever moved to Paris I would want Parc des Buttes Chaumont to be my neighbourhood park. It is curious, wacky and sublimely picturesque. 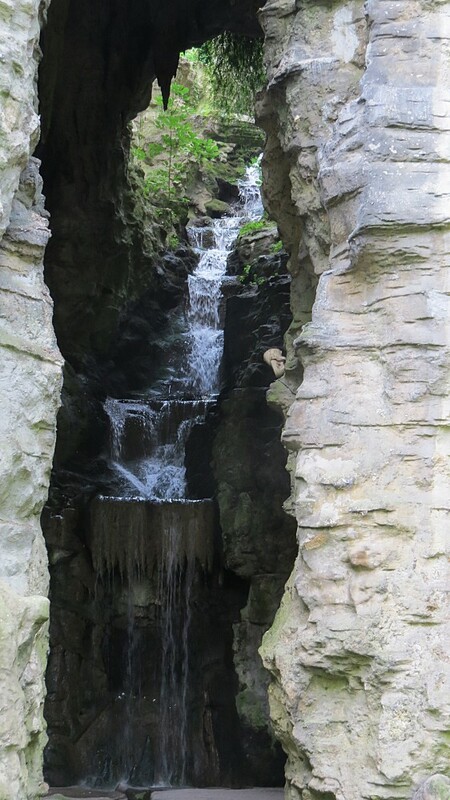 Where else might you hear a tiny Chinese woman with a high powerful voice sing for pleasure in an enormous cave full of stalactites, a half naked man practise tai chi in front of a high crashing waterfall, and toddlers being carefully guided by parents down a rock-filled stream? Add to that the large quantities of dynamite that were used to create Parc des Buttes Chaumont and I think you get the picture. In the 1860s as Paris was spreading rapidly, an enlightened Napoleon III commissioned Hausmann, Paris’s great city planner to turn what was a rubbish tip and large gypsum quarry into a new green space for the workers. The gypsum quarry was in the form of a large steep amphitheatre in the middle of which was a craggy hard limestone plug, some 30 metres high. 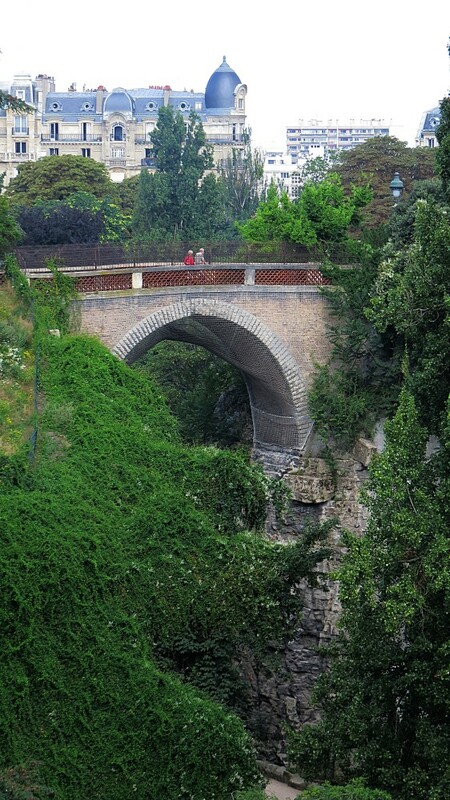 Adolphe Alphand, the park designer, created what I would say is probably Europe’s most romantic and picturesque city park with its distant views over Paris to the Sacre Coeur. The surprise is that it is not to be found on the tourist itinerary, and is not better known. Wide promenades curve around the steep hillside of the amphitheatre at differing levels dipping and rising through well-wooded slopes that hide the edges of the park. Smaller connecting paths make the promenades very accessible. The great variety of trees surprised me, making Des Buttes something of an arboretum. It is a wonderful park to explore, and away from the park edges the trees are interspersed with steep grassy banks that lead down to the lake. 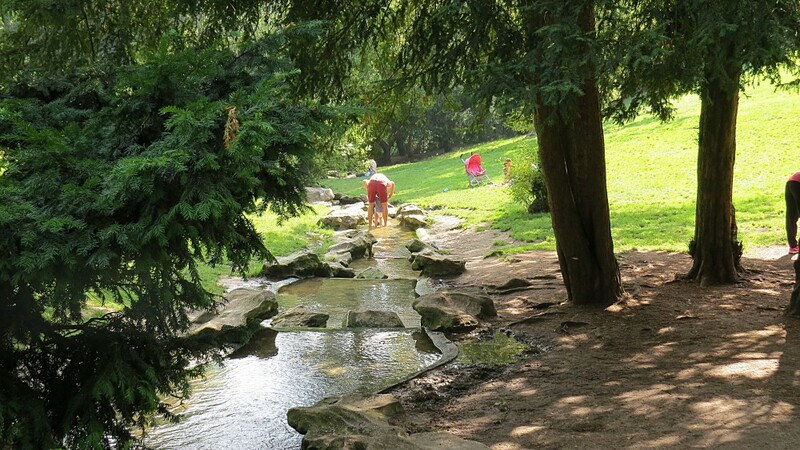 The layout provides interest and surprise, particularly the glimpses of the spectacular limestone plug that forms the centrepiece of the park. The plug is now known as the Ile de Belvedere and lies in the centre of a lake connected to the park by a pedestrian suspension bridge by Eiffel, and from the higher side of the amphitheatre by the aptly named brick and stone ‘Suicide Bridge’. A circular classical temple, La Temple de la Sibylle crowns the Belvedere and is the focal point of the park. 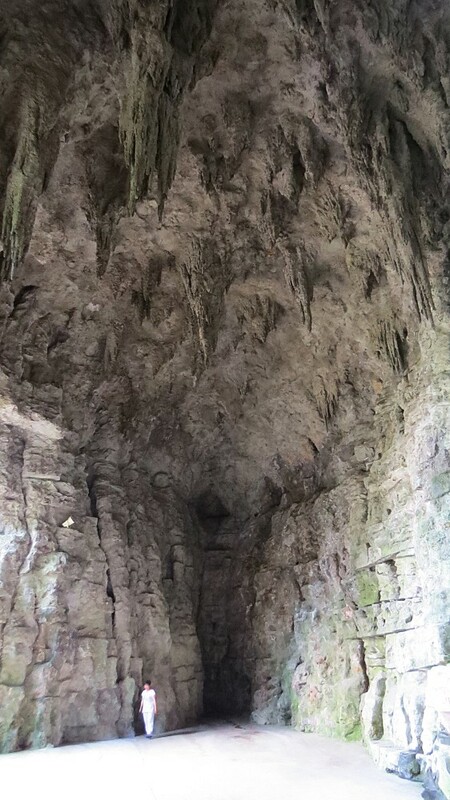 The other surprising feature that I greatly admire is its huge cathedral-like grotto now hung with limestone stalactites and with a dramatic 25 metre high waterfall cascading through the large opening in the roof. 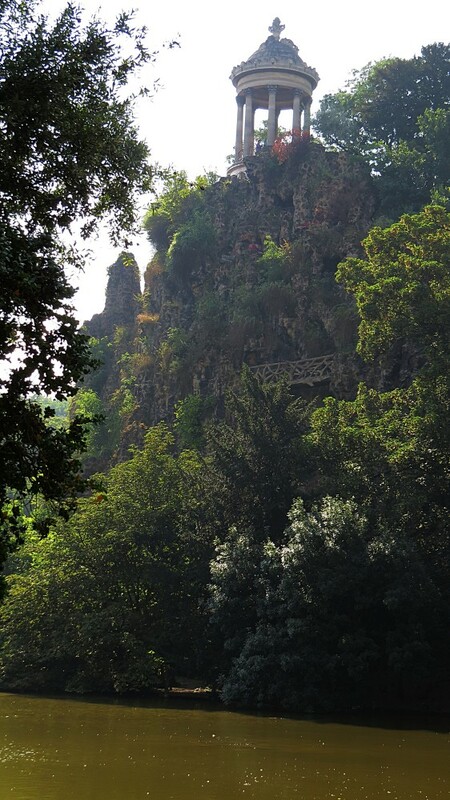 Dynamiting the grotto, and designing a system of pumps to raise the water from the nearby canal was an imaginative tour-de-force and the end result breath-taking. 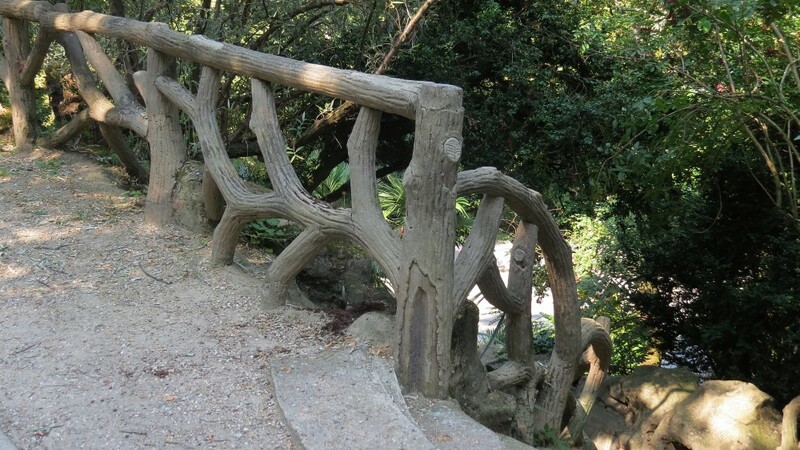 In addition to the liberal use of dynamite, designers in the 1860s were exploring the artistic possibilities of cement, not my favourite landscape material, but at Des Buttes the cement ‘log’ balustrades, tunnels, cascade rocks, and edgings work well, and have consistency and continuity. The colour has weathered back to something similar to the outcrops of limestone. Des Buttes is a popular well-planted and well-maintained neighbourhood park although my criticisms are that many of those neatly mown grass areas could be mown less frequently, and the haphazardly placed municipal beds of annuals would be best confined to the park entrances. This is a people’s park much enjoyed by dog-walkers, mothers with push-chairs, runners and elderly people sitting on the benches watching the world go by. On the warm summer’s day of my visit the grassy banks beside that soothing gently gurgling rock-strewn stream proved to be the greatest draw. A good cafe/bistro with terraces and beautiful views over the lake is another delightful asset. Des Buttes is a uniquely imaginative and well-executed solution to a difficult problem, and its stupendous views, quirky charms and charming informality have completely won me over.